An aquatic plant of spectacular beauty, that provides food from every part of the plant. To see a pond covered in sacred lotus in bloom is a magnificent, awe-inspiring sight. Large pink or white fragrant flowers (or other colours) 30cm or more across, stand on long slender stems, often rising a metre above the water. Leaves develop 30-60cm in diameter on stalks that grow upright from roots growing from the mud below. As new, blue-green, round leaves unfold, they lie on top of the water, then gradually fill out to full size and stand above the water. The flower centre is a yellow, flat-topped, conical receptacle, which develops into an 8cm brown seed capsule. On the top, up to 12 large holes hold smooth, brown, oval shaped, 2cm long seeds. As the seeds mature, the flower stalk dries, shrivels and weakens, turning the seed capsule downwards, allowing the seeds to fall into the water, with the potential for a new generation of plants to germinate. Seed viability is many years; in fact, seed thousands of years old discovered in ancient tombs have germinated. The World Book encyclopedia shows an illustration of a plant grown from seed found in Manchuria, China, believed to be more than 1000 years old. The lotus has been held in high esteem medicinally, in countries where it has been widely grown and used. Besides consuming the plant for food and to benefit overall health, lotus is also prepared as a flower essence, similar to the Bach Flower Remedies. Lotus essence, has been highly regarded as an elixir for any ailment, and as having a positive effect on the entire body. Lotus is said to provide better assimilation of other herbs, and an enhanced response to any form of healing. The essence is used to help energise the heart, liver, spleen, kidneys and intestines, for tissue regeneration, to slow the ageing process, and is used as a general cleanser for the whole system. 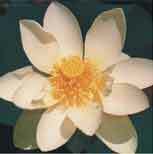 Lotus is also believed to heighten creative ability and mind power, and induce a sense of ease and peace. Every part of the plant is eaten. Roots, sometimes called rhizomes, are a prized addition to many traditional Chinese dishes. Peel the thin skin off the washed roots and slice finely into rings. An attractive internal pattern of holes will be revealed. This pattern is similar to the seed pod, but smaller in size. These holes are the root’s air channels. Roots are eaten raw, steamed, roasted, used in soups, sweet and sour dishes, salads, stir-fries, dipped in batter or tempura and fried, or made into pickles or other condiments. Roots absorb flavours during cooking, but keep their attractive appearance and firm and crunchy texture, making them a great meal time conversation piece. Young leaves are added to salads, steamed or used as wraps when cooking parcels of food. Young leaf stems are lightly steamed, tossed with sesame oil and served as a green vegetable. Flower petals are used in clear consommé or cold fruit soup, or used as a garnish on salads and food platters. Petals can also be dried and used in many dishes. Flower stamens make a refreshing aromatic tea. Seeds contain 18% protein and are eaten fresh, like a nut, or roasted. They can also be ground to a flour or paste like peanut butter. It is customary to prepare the seed by removing the bitter embryo before boiling or roasting. Within the seed, it is fascinating to see the shoot and leaf of the plant in amazing miniature. Roasted, ground seed are used as a coffee substitute. And for a special meal or celebration, pick a flower to decorate the table. Remove the stem and float the flower in a shallow bowl. The flower is exquisitely beautiful and the sweet perfume will captivate all who dine at your table.